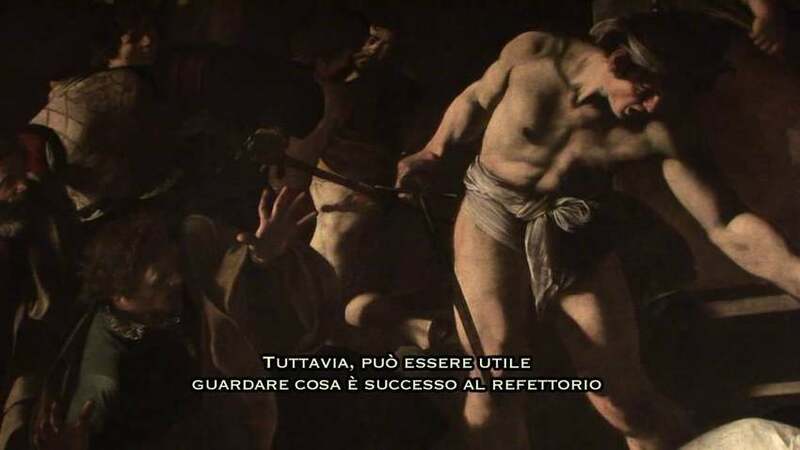 Above is a thirty minute film on the production of the three facsimiles of paintings by Caravaggio in San Luigi dei Francesi, including clips of the processes mentioned below in detail. 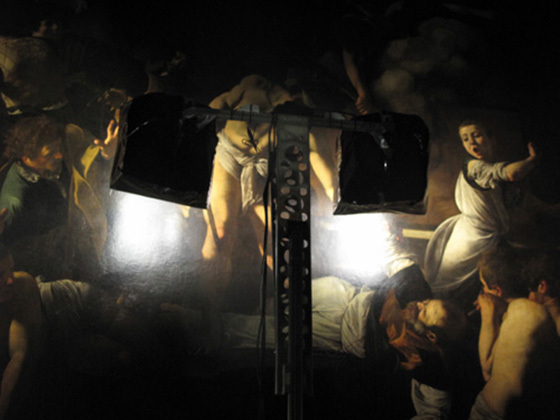 To coincide with the 400th anniversary of the death of the Italian artist Caravaggio, the Municipality of Caravaggio commissioned the Fondazione Giorgio Cini and Factum Arte to make facsimiles of three paintings in the Church of San Luigi dei Francesi in Rome. Once made, these facsimiles became part of a Research Centre which opened in September 2010. The high resolution recordings were carried out over a four week period from September 15th to October 14th 2009. Work on the facsimiles is finished and the production of a browser that allows the digital files to be viewed up to five times the real size has been completed and can be seen on our Data Presentation page. The three paintings, depicting scenes from the life of St Matthew were commissioned for, and are currently housed in, the Contarelli Chapel and were actually Caravaggio’s first public commission. Initially the commission consisted of two large paintings, Calling of St Matthew and Martyrdom of St Matthew 1599–1600, with the third, St Matthew and the Angel, added in 1602. Michelangelo Merisi da Caravaggio (1571 –1610) was one of the most influential Italian painters of the 17th century. His work proposed a new form of gritty realism which answered the requirements of the counter reformation. However, it provoked great controversy and some critics found his style inappropriate when applied to religious contexts. His use of artificial and theatrical light lent a heightened sense of drama to the scenes and characters depicted, charging his paintings with an intense pathos. More recently the paintings have been the subject of a different type of controversy; David Hockney, Roberta Lapucci and others have suggested that the images were made using some form of optical system. Evidence supported by the high resolution documentation points towards this theory and Factum Arte is now working with the Spanish realist painter Manuel Franquelo to reveal how they believe the paintings were actually made. The result of this collaboration will be a short video that will be shown at the Research Centre. The three facsimiles will allow academics and enthusiasts to view the works up close, and study them in great depth. The original works, hanging in their intended location in the Contarelli Chapel attract many visitors and as a result can only be seen at an angle as access into the chapel has been reduced. The quality and accuracy of the documentation is unparalleled. 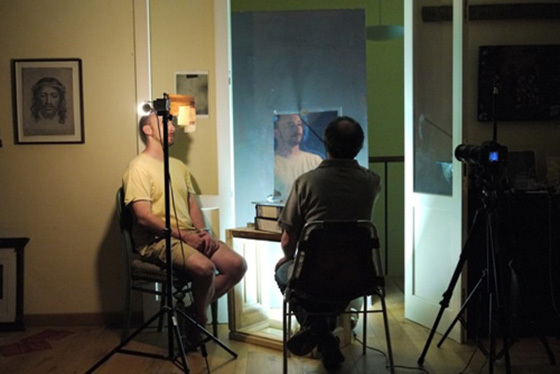 The two photographic stages are necessary in order to capture every detail in the paintings. The first is high resolution photography. All the paintings were photographed in small sections as 1:1 images taken at 700 dpi. This was done using equipment specifically designed for this work. The mosaic of photographs are stitched together in Madrid to create one huge file of each painting (approximately 6 gigabytes for each painting). Factum Arte’s conservation experts make exact colour charts which are an essential tool to ensure exact colour when making the facsimiles. The second type of photographs are raking light images, which reveal subtle changes in the surface, the complex texture in the ground and paint layers, and cracking and interventions made during restoration. 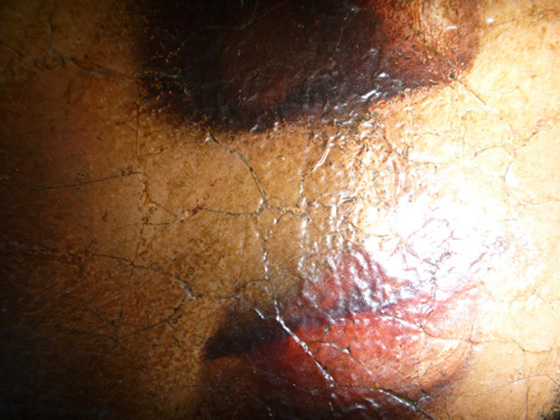 This information is vital for recreating the texture and surface on the facsimile. Comments are added on separate layers to the scanned files. These notes help locate artifacts and relevant information in the paintings before the production of the facsimiles. Adam Lowe comparing facsimile tests and originals in San Luigi dei Francesi, Rome. Factum Arte's Rafa Rachewsky preparing the gesso. Colour sample comparison after printing. 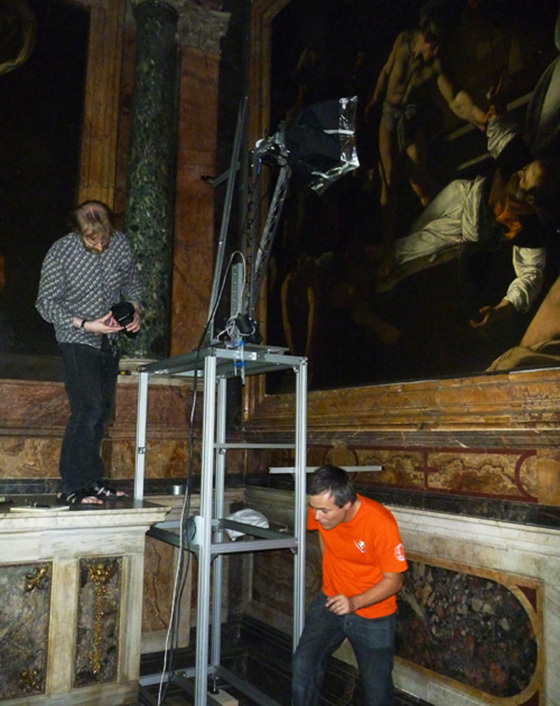 When printing these Caravaggio paintings it is interesting to note that the figures are life-sized. The following images are of the Caravaggio facsimile pre and during the retouching process which is done by Factum Arte's conservator, Naoko Fukumaru. The seamless joined facsimile after it has been retouched. The first test for assembling the whole painting failed as the joins started lifting and the colour was solarised slightly as a result of the heat used to fuse the beva film to adhere the section to the re-lining canvas. As a result the following stages were carried out to rectify the problem. Applying epoxy resin and fibre-glass tape to strengthen the back of the printed canvas joins, weights are applied to help it to dry flat. The printed sections are joined together from the back with a spun fibreglass matting that is impregnated with epoxy resin. The intention is to keep all the joins absolutely flat and prevent the slight curl that caused the problems in the first tests. A flat surface is required in order to ensure the retouching is invisible. The fibreglass/resin strips are covered with plastic and weighted during the curing of the resin. Adam Lowe and Naoko Fukumaru cover the backing canvas with Beva Gel. Steel weights measuring 25x25x1cm are used to flatten the canvas after gluing to the backing canvas with Beva Gel. 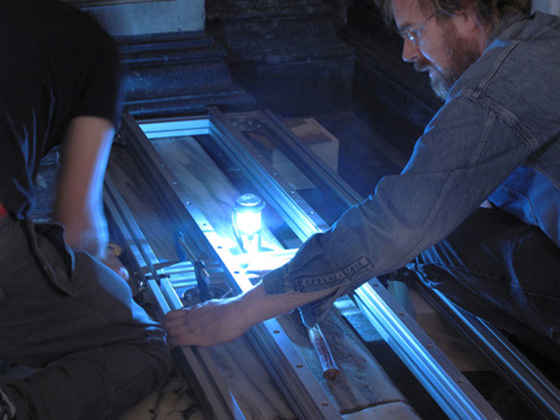 Rafa Rachewsky using a hot air gun and weights to flatten the joins. The whole painting is stuck down, now waiting to have the joins retouched. The retouching of the joins. A retouched area: now the joins are invisible. Following a similar method to the previous painting, colour matching for the second painting The Inspiration of Saint Matthew. Sticking the lining canvas to the image canvas with Beva gel and weighted down to keep flat. Aligning the joins (there are no horizontal joins for this facsimile). Adam Lowe and Naoko Fukumaru discussing the retouching. Adam Lowe and Naoko Fukumaru inspecting the finalised facsimile. 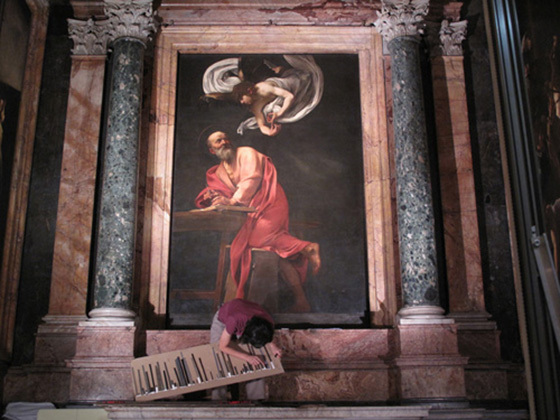 Blanca Nieto preparing the files for the 3rd Caravaggio painting, The Calling of Saint Matthew. The vertical joins being aligned. On the 22nd September at a press conference the 3 facsimiles of the paintings from San Luigi Francesi were officially unveiled in the Sacristy of the Church of St. John the Baptist in Caravaggio. 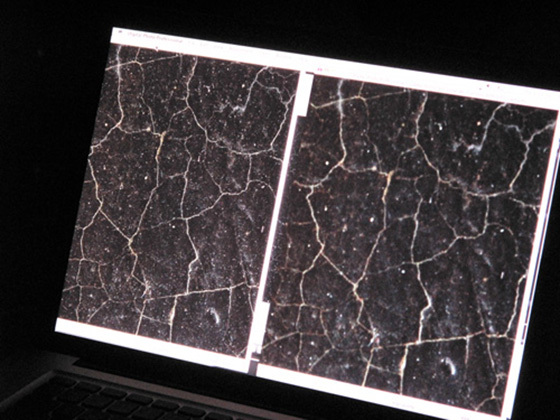 They were shown with specially designed "viewers" so the high resolution data can be viewed at up to 5 times magnification. There was also a 30 minute video explaining the recording and process of making the facsimiles and an investigation into Caravaggio's working method carried out with the realist painter Manuel Franquelo (see top of page). 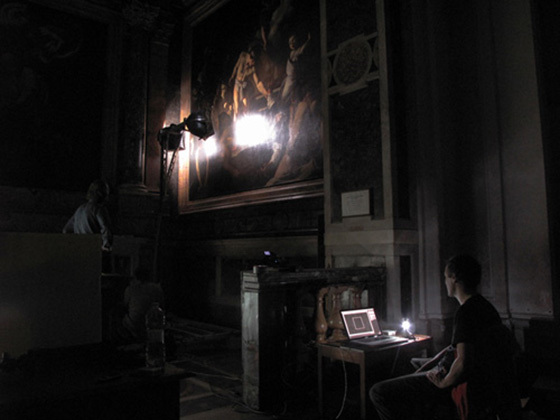 In the final location of the finished facsimiles, a control allows the viewer to modify the intensity and tone of light projected onto the facsimiles thanks to a Philips system of LED lights.